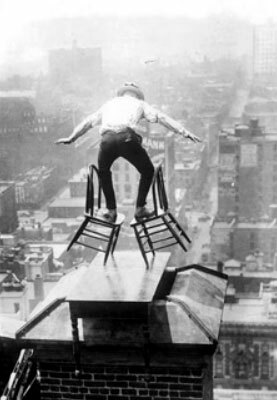 At the heart of organizational growth, success, and survival is a balancing act. It’s a feat that requires leaders to solve again and again the conundrum of how to keep what’s working today healthy and productive, while actively feeding ideas and executing plans for what will work tomorrow – what will bring future survival, profitability, and growth. It’s simple in principle, but certainly not easy. The two mandates often conflict, and a natural fear of failure and tendency to maintain the status quo can drive even the most successful organizations into a death spiral. How long can a company survive, and how? Corporate lifespans are shrinking¹ . The average life of an S&P 500-listed company was 67 years in the 1920s; today it’s just 15 years. The extinction cycle is normal. We’re not suggesting that companies can or should survive indefinitely, and the reality is, they won’t. But they should have a shot at a long and healthy life. The most commonly agreed-upon factor for long-term company survival is innovation -the ability to adapt and renew an organization’s value propositions through changing circumstances. But even when companies try to do all the right “innovation things,” they can get it seriously wrong. Take LEGO, for example. After decades of steady and then surging growth, the company encountered a sea change in its environment in the 1990s. Tough competition emerged from China, retail outfits consolidated, and an onslaught of new game technologies drew its classic market away at younger and younger ages. They knew they had to innovate and did so aggressively, with massive investments in a slew of new products. Unfortunately, while some products were successful, at least for a while, the investment outweighed the overall product performance, and within 10 years the company was about to run out of cash. As discussed in a recent article² LEGO had to take a step back and rein in its innovation initiatives. They created a more structured and strategic effort that encourages everyone to bring on new ideas for growth, but all concepts must also be keenly evaluated for consistency with LEGO’s company goals. Its new approach has started the company moving ahead again, in a more realistic and controlled way. What needs to be balanced, and what works? To keep your organization on a successful trajectory, leaders must be able to balance risk and reward across portfolios that include both new initiatives and ones designed to keep the existing business producing well (that is, those aimed at long-term growth versus short-term profitability). They must also balance the entrepreneurial personalities of “idea monkeys” with the more skeptical approach of the “yeah, but…” types (those who focus on effective execution and keeping things grounded)³. – our infrastructure – the processes, community, and metrics that will set you up for systematic growth and success. – game-changing concepts that plant the seeds of new businesses and require new business models. While these strategies won’t guarantee that your organization will live forever, it will certainly give you the best chance of succeeding over the long haul.